Looking for the Tableau Configuration Utility? As of version 2018.2, the Configuration Utility has been replaced by Tableau Services Manager (TSM). For more information about TSM, see Comparing Functionality of tabadmin and TSM. To view the archived online help for the 2018.1, see Tableau Server 2018.1 Configuration Utility. This topic describes how to configure essential server settings as part of the initial Tableau Sever installation process. 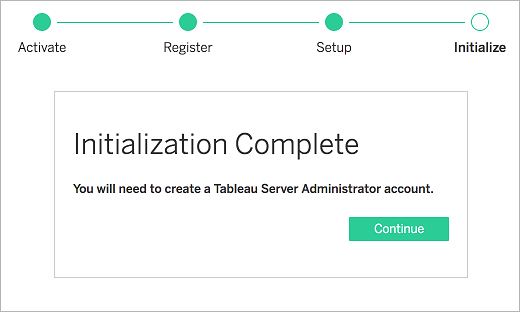 After you have activated and registered Tableau Server, the installation program will display the Setup page. If you need to configure Tableau Server to connect to an LDAP directory that is not Active Directory, then you must use the Configure Initial Node Settings. Important: After you have configured and applied settings for the identity store, it cannot be changed. . If you select Active Directory, Tableau Server will populate the Domain and NetBIOS fields from the computer on which you are running Setup. In some cases, Setup may not display these attributes. For more information about how Tableau Server connects and communicates with Active Directory, see User Management in Active Directory Deployments. By default, Tableau Server runs under the Network Service account. To use an account that will accommodate NT authentication with data sources, specify a user name and password. See Run As Service Account to learn more about creating and using a specific user account. Important: Include the domain name with the user name—for example, example\tableaurunas. Enter the password that you created for this account. The default port for web access to Tableau Server (via HTTP) is port 80. If the installation program determines that port 80 is in use when you first install Tableau Server, an alternate port (for example 8000) is used and shown in the Port number box. You may need to change the port for other networking needs, for example, if you have a hardware firewall or proxy in front of the Tableau Server host, this might make running a back-end system on port 80 undesirable. By default, Tableau Server will install sample workbooks in the Default site when you initialize the server. Alternatively, you can publish samples after installation by using the publishsamples tabcmd command. After you have configured the options on this page, click Initialize. You must configure the identity store settings for the Tableau Server computer. 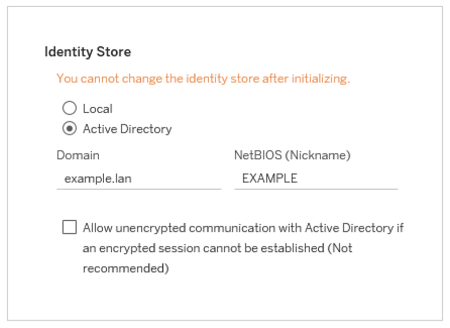 Important: After you have configured and applied settings for the identity store, it cannot be changed. tsm settings import -f path-to-file.json. 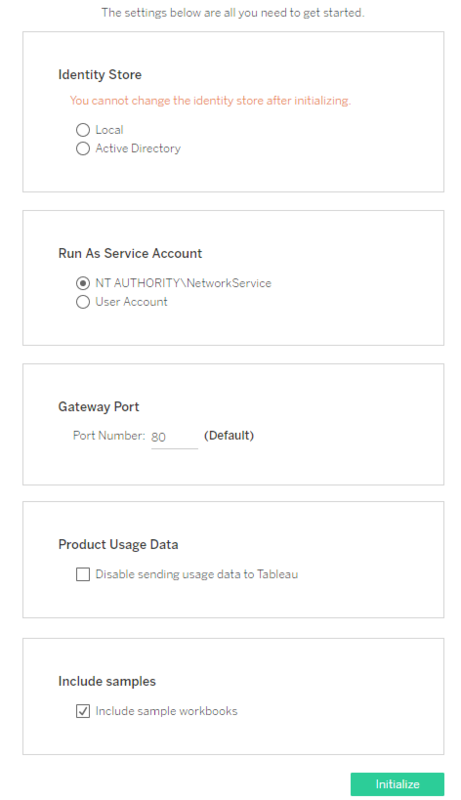 Depending on your network requirements, you may need to configure the gateway settings for the Tableau Server computer. For example, if you are enabling SSL or configuring access to Tableau Server with a reverse proxy, you may need to configure gateway settings. See gatewaySettings Entity for more information. tsm settings import -f path-to-json-file.json. You can publish samples after installation by using the publishsamples tabcmd command. Now that you've created and set initial configuration, you must apply them. When you apply configuration changes, tsm will verify the settings you've set before committing them. Once this command has completed, TSM processes are running, and Tableau Server is configured but is not running. If your identity store uses Active Directory or OpenLDAP, then we recommend verifying LDAP connectivity before proceeding. User and group names must be valid names that exist in the LDAP server that you are connecting to. If your LDAP connection is set up correctly, then the user or group attributes will be returned to the shell. If your connection is not set up correctly, then an error will be returned. This saves time by starting the server running after initialization. This stops the server after initialization. After initialization is complete, create the Tableau Server administrator user account. See Add an Administrator Account.